When we are speaking to groups, we commonly ask members of the audience to raise their hand if they are a leader. In most cases we observe some hesitation and then about two-thirds of the people in the group will raise their hand, with the exception of senior leadership groups. We find that this hesitation exists because many people do not see how leadership relates to their position. We typically think of a leader as someone who is in a position of authority. While this is true, it is not the whole picture of who is a leader. Leadership starts at the foundational level of how we lead our self in life and work activities; from there, leadership expands as our responsibilities for team and organization increases. Leadership encompasses how we direct our self and others in achieving positive results. A leader is someone who inspires and guides others toward a common goal. They are the person who is in charge of something or has a scope of responsibility for people and positive results within the team or organization. These responsibilities and results can be categorized into self leadership, team leadership, and organizational leadership. To lead well in these areas, we need a set of skills. Leadership skills mean that we have the knowledge, behaviors, and attitude to lead self or others to achieve specific goals. Regardless of having a formal leadership position, leadership skills improve the performance of the individual, the team, and the organization while contributing to positive results. Teacher – Teachers are responsible for their students and the learning that takes place in the classroom. They are leaders in their classrooms and role models in their community. 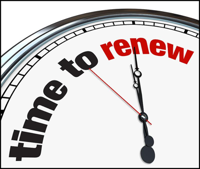 Their stakeholders – students, parents, and administrators – require positive results and personal character. College Student – Students are responsible for leading their education efforts. Parents and community may be stakeholders in the education effort, particularly if they are funding the education; but the responsibility for learning and achieving the college education is upon the student’s shoulders. Students are leaders of self and their proficiency in self leadership skills impact their personal results, their contributions in team activities, and their future career opportunities. Project Manager – Project managers are responsible for the success of the project. They are responsible for budget, schedule, and quality. Project managers have many stakeholders and effective leadership skills are mandatory for their personal success and the success of the project. Single Mother – A single mother is responsible for her children and career path, thus she is a leader of her family and her career. To lead a thriving family and career, she must first be a proactive leader of self and while guiding her children. Having effective self and team leadership skills contributes to positive results for her family and her career opportunities. President or CEO – This position is one we usually equate to a true leadership position. This leader is responsible for the people within the organization and the organization’s results; thus, self, team, and organizational leadership skills are mandatory for this position’s success. Stakeholders in this position are customers, employees, shareholders, and the community. Warehouse Worker – As a frontline employee, the warehouse worker is responsible for doing their defined work according to organizational standards. They are also accountable to their boss for positive results in their area of work. Although frontline employees don’t have people they are responsible for within the organization, they need proficiency in self and team leadership skills to get the best results now and for future opportunities. As you can see from these examples, each individual has different situational and competency needs to exceptionally achieve results in their position’s responsibilities. However, they all share the same foundational competency requirements that facilitate successful results. From over 20 years of experience and research in the skills and behaviors (competencies) effective leaders use everyday and in varying positions, we developed the 4Ps Leadership Compass Competency Model™. This model consists of 30 competencies that support 4 leadership skill headings (4Ps): Persuasive Vision, Positive Results, Personal Character, and People Skills. Each of the 30 competencies contributes to achieving effective self, team, and organizational results and correlates to all positions within the organization, determining the degree of success in the position. In briefly analyzing the 4Ps Leadership Compass Competency Model™, notice the positions of the 4Ps’ headings on the compass. 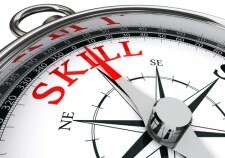 Competent leadership skill starts on the north and south compass headings. Having a persuasive vision with personal character is what guides the leader when performing self, team, and organizational responsibilities. A persuasive vision that is formed and practiced with personal character is paramount to responsible leadership. 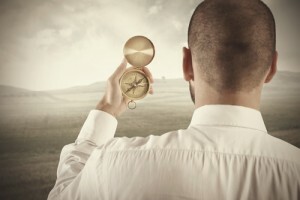 Persuasive Vision is at the north heading on the compass and gives clarity to our vision. A persuasive vision keeps us heading in the right direction to achieve our personal, team, and organizational goals. A persuasive vision guides our behaviors so that our vision comes to fruition. A persuasive vision is applicable in self, team, and organizational leadership. 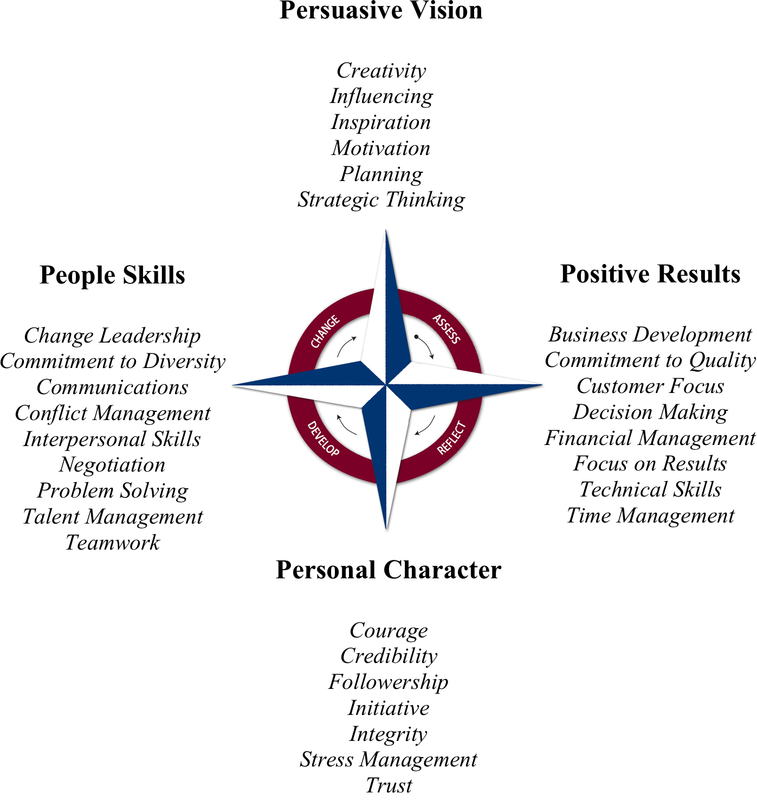 Personal Character, at the south heading of the compass, is foundational to and applicable to all 30 competencies as it influences behavior in each. Character is personal to the individual first and helps shape team and organizational standards. Leaders and their stakeholders that do not hold value in personal character impair the vision, people, and attainment of positive results through their behaviors and practices. This negative behavior is typically observed in those who have or want power to be solely for their own vision or selfish ambitions. At the east and west headings of the Leadership Compass we find People Skills and Positive Results. These 2 leadership competency headings signify the primary responsibilities of the leader – people and results. They are also tied together because the people within the organization are a necessary ingredient to achieving positive results. People Skills, at the west compass heading, shows the skills needed to effectively lead and interact with others. A leader with effective people skills grows the talent of the organization and is able to solve problems that encumber people and results. Leaders with effective people skills bring everyone together to achieve the team and organizational vision and they know how to positively manage change within the organization. Positive Results, on the east compass heading, are the competencies that are essential to achieving positive results. Each of these competencies relate to our ability and skill in getting things done that produce positive results for self, organization, and multiple stakeholders. All of the 4Ps on the Leadership Compass Model™ work together. For instance, if you are a team leader your behavior determines your effectiveness in your role. For example, how you communicate the vision and priorities; how you work to get results; how you develop your talent; and how you work with your fellow employees with personal character. As you review these competencies, think about how they apply in the earlier examples. Whether a teacher, college student, single mother, CEO, or warehouse worker, each of these leadership competencies helps shape successful results for self, team, and organization. The need for in-depth leadership competence (self, team, organization) increases as the responsibility for results increases. Achieving the desired results for self, team and organization is determined by our skill in leading others and ourselves in our day-to-day responsibilities. Leadership skills are always an asset, regardless of position, because it equips self, team, and organization to achieve the best results. Reflect on h ow each of these leadership competencies affects your responsibilities in your work and career, your family, your community involvement, and most importantly, personally in your day-to-day needs. What leadership skills do you need more of to get the job done with the best results for yourself, your family or team? Use this model and the other articles and tools from our website to identify where you want greater effectiveness in leading yourself, your team, and your organization.